Every Sunday I get an email newsletter from Andy Ross at Global Yell in Shetland. Today’s included a post about research into linen making in Shetland and there was a photo of a little book with a linen cover – ‘Songs of the Spindle and Legends of the Loom’. This sounded irresistible and I went looking for it online, discovering there are a few copies for sale in antiquarian bookshops and each one is too rare and costly to contemplate. I did find treasure, though. The whole book has been digitised and is in the California Digital Library and so available for all at The Internet Archive. It’s full of poems and prose about spinning and weaving, with delightful illustrations and woodcuts. You can really get a sense of the physicality of it even through the screen. There’s a page-turning mode so you can view the pages close up, including the tactile linen cover, and there are various formats to download. 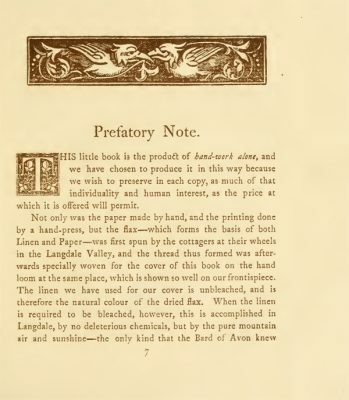 The paper was made by hand ; the cover is of unbleached flax spun by Langdale cottagers, and woven on a hand-loom ; the printing has been done at a hand-press. A kindly thoughtfulness has given the names of all, or as nearly all As it was possible to give, who have had a hand in the work. Editor, publisher, and illustrator we are accustomed to know by name ; but it is good, also, to be aware of our obligations to spinner of thread and weaver of linen, and binder. I found a quirky personal connection as well. As the review in The Spectator mentions, the linen of the cover was spun and woven in Langdale, and the first illustration in the book is a view of the Langdale valley. And one of the reasons I’ve been so quiet here is that we have been away for a while, setting up Spinners, a holiday flat in Grasmere, just a few miles from Langdale. 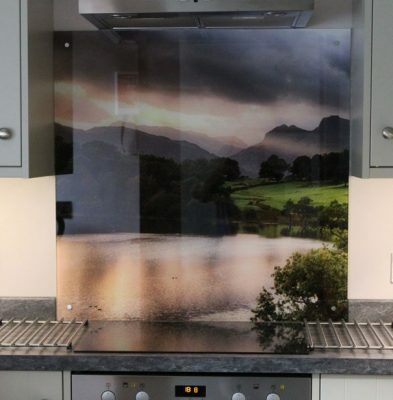 The view in the book is almost the same one we chose for a kitchen splashback at Spinners! As I virtually ‘thumbed through’ the book (isn’t it interesting that thumbs are also digital), I saw that the foreword was by a man named Albert Fleming, who had facilitated a revival of spinning and weaving in Langdale in the 1880s. 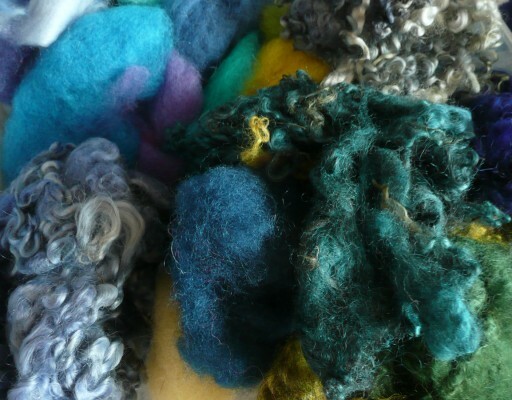 I hadn’t known anything about the textile history of Langdale before today, but when I’m next in Cumbria I’d like to try and find out more about this. I’ll leave you with a couple of lines quoted by Albert Fleming that really resonated with me – does anyone know what this is from? Late, but I hope not too late, my attempt at Racing Stripe for the Web Spins Challenge, working through the book Spin Art by Jacey Boggs. 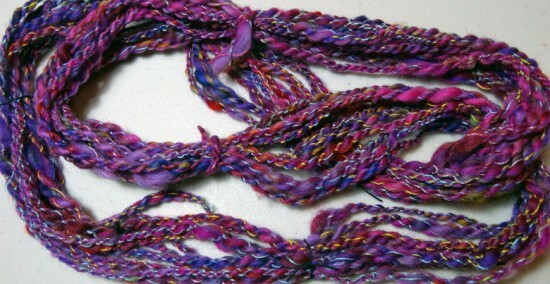 Racing Stripe consists of spinning a singles yarn while letting an existing yarn wrap around it in a controlled way. I had this small arty batt carded and for the wrapping I chose a variegated cotton yarn that would sometimes contrast and sometimes blend in. The spun singles. I ‘lost’ the striping yarn a few time in the fibre, especially to begin with. 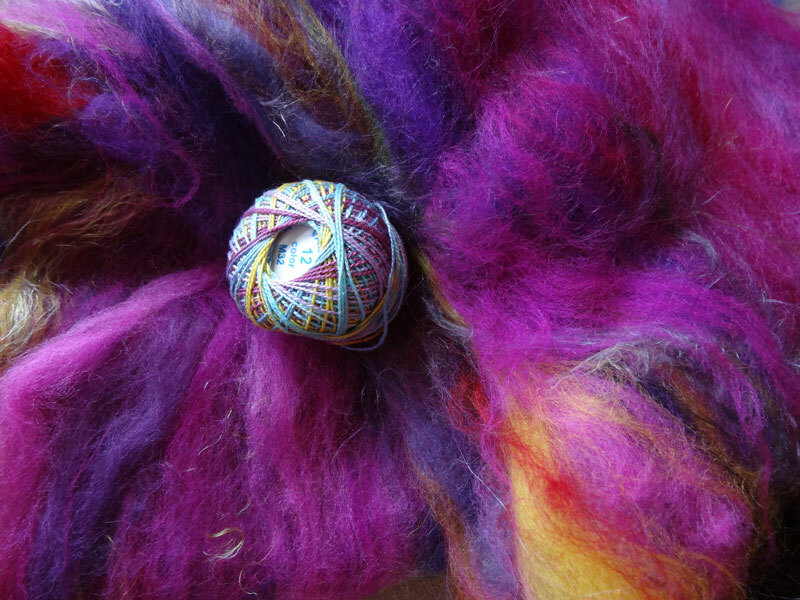 My batt was only carded once and was quite textural so I went with the flow as I drafted, resulting in some thicker parts with less wrapping and some thin, heavily wrapped sections. 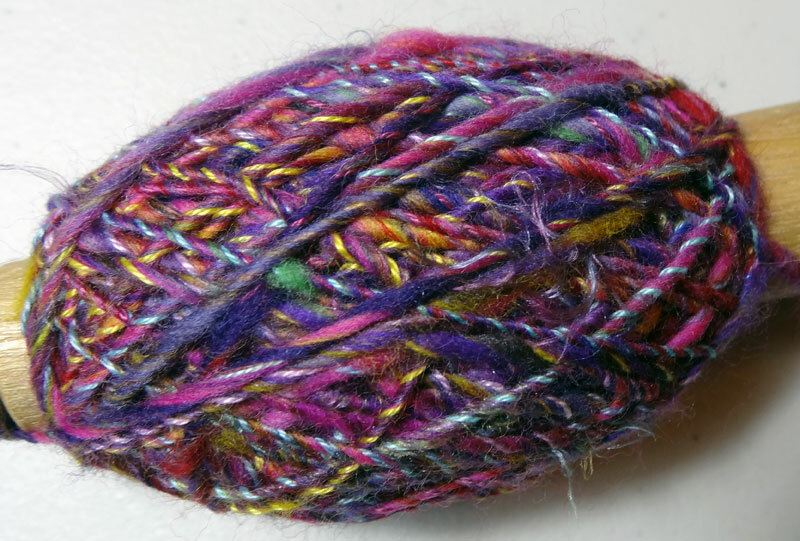 I plied it – it’s supposed to be a singles but I wanted to see what would happen. It will find its way into a weaving sooner or later. 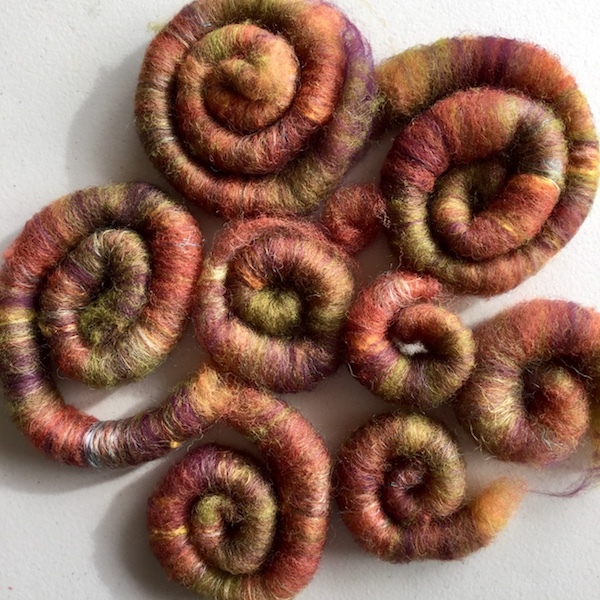 A few months ago I went on an art retreat with my spinning wheel and tried out a few of the techniques in Jacey Boggs’ book Spin Art. Since then I haven’t had time to pick it up again or practise what I learned, but Monika of red2white and Marian of Florcita are just starting a new challenge, Web Spins: ‘The aim is to improve our basic spinning and learn new spinning techniques to be able to create various types of textured yarns’. Slow spinning – one technique a month. Sounds perfect.